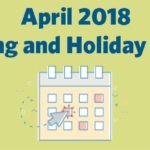 ﻿ April 2018 Marketing and Holiday Planning » Red Mango Marketing! April marks the first full month of Spring. This means the start of warmer weather, longer days, and more opportunity to gain new customers with Constant Contact! This time of year brings people outdoors. Do you have a plan to get that foot traffic headed your way? Need ideas for Spring sales? Whatever your goals are for the start of this season, the content below can help make April the best month of your year! The post April 2018 Marketing and Holiday Planning appeared first on Constant Contact Blogs. This entry was posted on Wednesday, March 28th, 2018 at 8:00 am	and is filed under Email Marketing, News & Updates. You can follow any responses to this entry through the RSS 2.0 feed. Both comments and pings are currently closed.